WEBINAR #1: How to Write a Thank You Letter That Makes Donors Smile and Want to Give Again! Now is a great time to set aside some time to show appreciation to your donors who have supported your organization over the past few months. The great news is that saying “thanks” to your donors goes a long way...not only will your donors feel appreciated, but it can improve your donor retention. This three-webinar bundle will show you a variety of ways to make your donors feel loved! First, you'll learn how to write the perfect thank you letter. According to multiple studies, the thank you letter is the first--and possibly most important--step in donor retention. Your thank you letter should be personalized. It should be authentic. And it absolutely must be donor-centered. We'll show you how. But thank you letters aren't the only way to thank your donors...next, you'll learn how thank you videos can help you stand out to your donors! 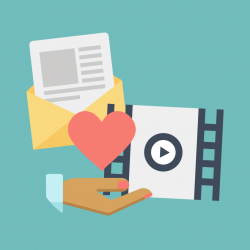 Thank you videos are a simple and powerful way to communicate appreciation to your donors and demonstrate the impact of their gifts. You don't need to be a videographer or have special storytelling skills to create a simple and powerful thank you video. Finally, in the third training, you'll about a variety of other ways you can make your donors feel appreciated...from mail, to phone calls, to newsletters and online techniques. You'll see examples of other small and medium-size nonprofits who have created effective thank you letters and videos with minimal resources and little experience. "Donors are obviously the lifeblood of nonprofits. As a relative newcomer to the field, I found this webinar immensely informative and helpful. A great investment!" "It goes without saying that thanking donors is important but it is easy to do the wrong thing. This webinar highlights just how important that thank you is and breaks down every detail of the thanking process, leaving you with the knowledge and skills to increase donor retention and cherish your donors in new ways." Julia Campbell is a storyteller and nonprofit digital strategist, providing workshops, webinars, and consulting services to nonprofit professionals in organizations of all sizes. She is the author of Storytelling in the Digital Age: A Guide for Nonprofits. Using social media, email, blogging, and online fundraising platforms, Julia has a long history of helping nonprofits find success online. After 10 years in the nonprofit sector as a one-woman development director and marketing shop, she founded J Campbell Social Marketing, a boutique digital marketing agency based in Beverly, MA.